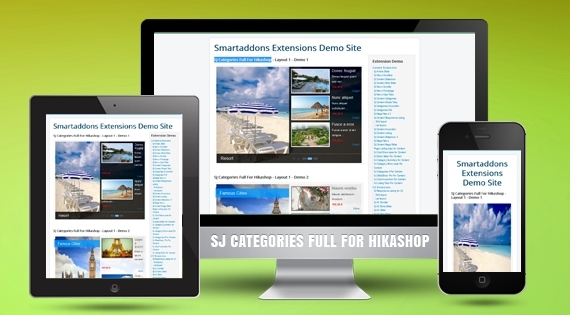 SJ Categories Full for HikaShop has been released and supports for HikaShop component. Showing your products has become more professional and easier with this powerful module than ever. Take a look at our demonstration of this module, you will realize that items of each category are arranged in a clear and modern way with support of 2 main layouts. By using mousewheel or click into direction button, group of items appear smoothly with preview image, title, description and link to detail of each item. This is an ideal module integrated with diversity of both simple and professional effects for displaying items on your frontpage. Moreover, items within a single are of website have chance to show their best features flexibly and logically. Users can also make use of price detail or add to cart/wishlist button for websites selling products and other types of webpage. More Joomla extensions for HikaShop component are coming soon. So, don't forget to follow every step of us. Now, let's click View Demo button to make sure that you don't miss anything from us!